In my experience it's not surprising to see it but not rampant. And notably it tends to be people going GPL to HOT, not the inverse. I think a double white (especially with chevron markings) holds exceptional weight in Canada, due to the illegality of crossing any solid white line, never mind two! Here in the US, crossing a solid white is only discouraged, so it's possible that some drivers are not correctly interpreting double solid to mean "illegal to cross" (instead, "you really shouldn't cross here"). In Ontario pavement markings - white, yellow, otherwise - hold no legal weight unless accompanied by a regulatory sign. Can't speak for other provinces but that's the case here. In spite of that being taught in driver's ed, a surprisingly large number of people here don't even know that. What's even the point of using different colors if they have no enforceable difference in meaning? Hmm, that's interesting. In BC, it's definitely not legal to cross a solid white. It's advisory. Yellow markings indicate that the road is bi-directional. White ones are for the same direction. Kind useful to recognize the difference, and know which direction other vehicles may be coming from. There's no law against driving on the left side of the centreline. But if another vehicle approaches, you are required to yield that side of the roadway to them. The yellow line is just there to delineate where that separation should occur. Wow. I'm not aware of any other jurisdiction In North America with such a setup. Are there any double solid yellows in Ontario? In BC, as in the rest of Canada, single solid yellow is king. But there are many double solid yellows. While there are many signs indicating "no overtaking" in these areas, my understanding is that the double solid yellow would be enforceable on its own. And the signs were extra. Double line markings are only required where permissive passing opportunities must be indicated by direction of travel, where the posted speed limit is 70 km/h or more, or where additional emphasis of a passing prohibition is required. So the instances where single yellow is actually doable is limited. Low volume roads do not require a marked centreline at all, though the definition of low volume varies depending on roadway width. Reminds me of BC. Single solid yellow is pretty much the only centre-line marking used in the city (lower speed limit), whereas double solid yellow is used outside of the city (higher speed limits). I would say that single yellow lines are more common than doubles within cities. Highbury Ave in London seems to vary (GSV links). The bridge over the canal is nearing completion, and top coarse pavement is being applied on some of the 400. Is this going to full 3x3x3x3 C-D system? Sure looks like it but I didn't expect it to be. 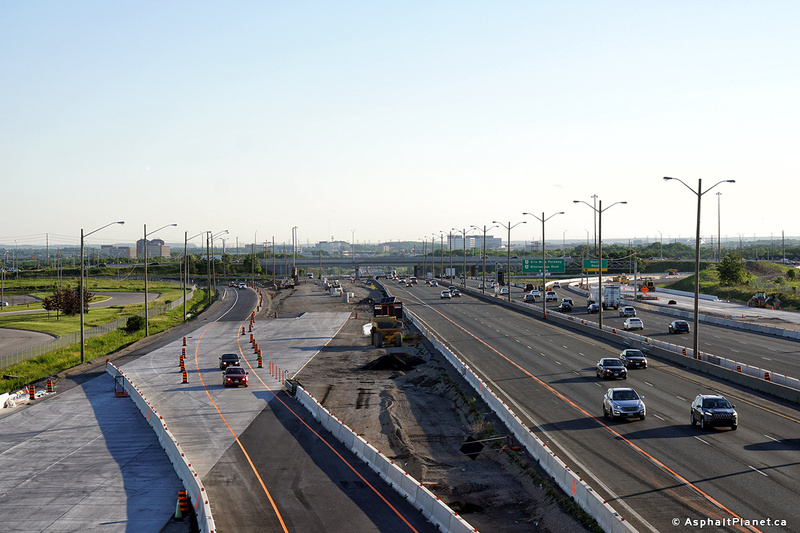 It'll be 10+HOV (so 6 total lanes per direction) between 8 and 24. The staging does make it look a bit like a complex freeway but it'll be conventional (well, with HOV) when work is completed. Which is surprising considering that the temporary median barrier has full width shoulders. Is there going to be a transfer there? It looks like the new collectors will split from the express. [Which is surprising considering that the temporary median barrier has full width shoulders. There aren't full width shoulders through the construction zone. There are some shoulders, but they are far narrower than a typical median. [Is there going to be a transfer there? It looks like the new collectors will split from the express. There will not be a transfer there. I'd guess when the MacLaughlan Road overpass was built the preliminary design probably did include an eastbound transfer between Mavis and Hurontario (there is one going westbound), but it wasn't included in the final design). So then what's the reason for the splitting? 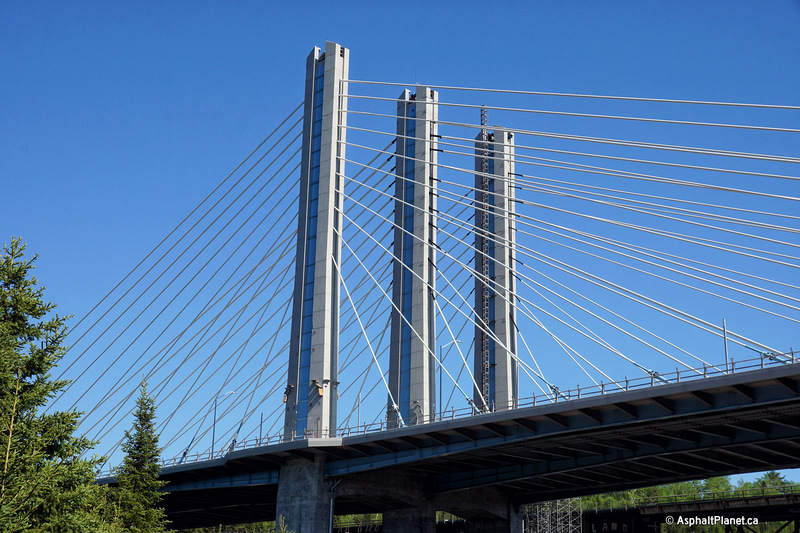 The bridge piers from the McLaughlan Road overpass. 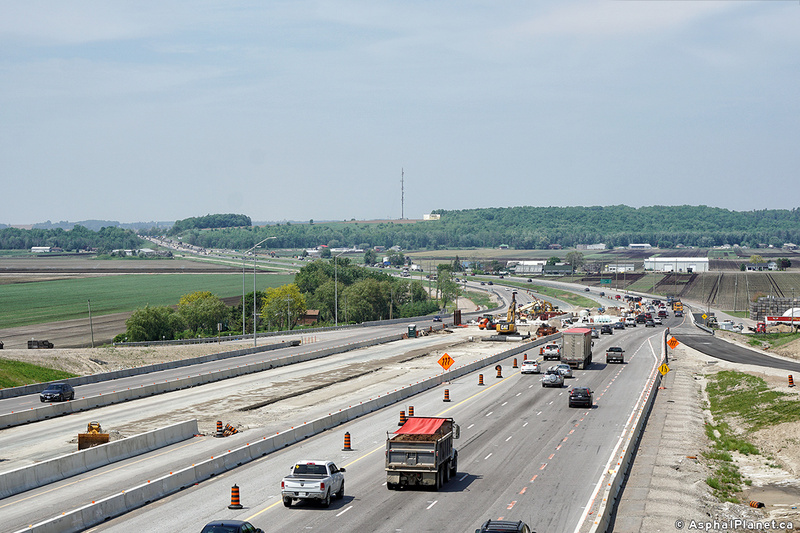 The McLaughlan Road overpass was built several years before construction started elsewhere to widen the 401 west of the 410. 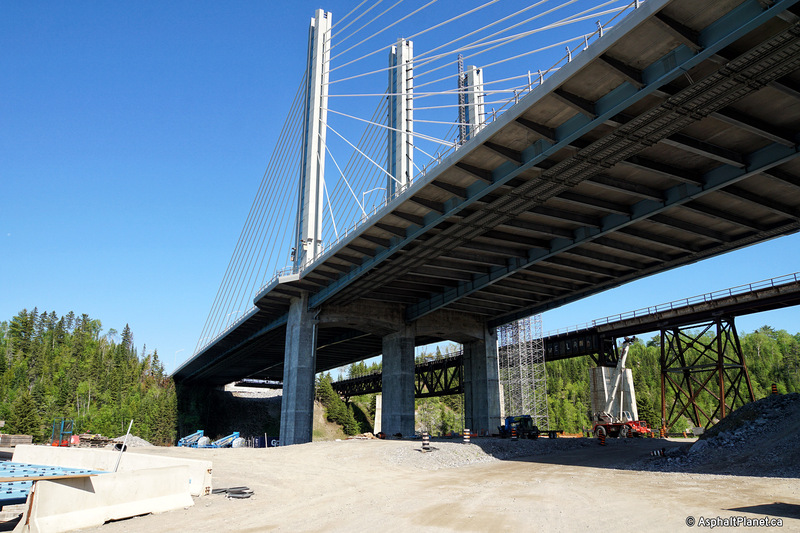 The McLaughlan Road overpass was obviously built for a different cross-section than what has ended up being constructed. If the collectors didn't deflect out as they do, one of the collector lanes would have a bridge pier in the middle of it. Are you serious? 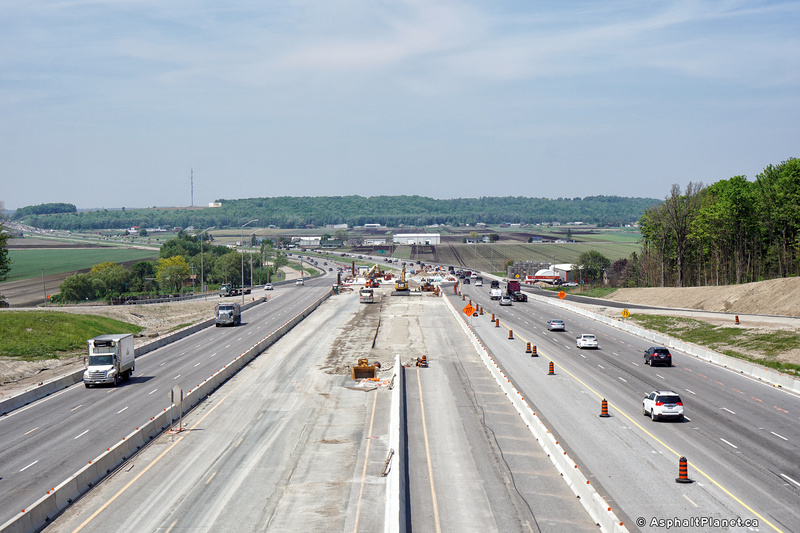 The McLaughlin Road overpass was rebuilt a year or two before the old Hwy 10 overpass came down. I don't buy that explanation, someone must of royally screwed up here somewhere. The McLaughlin Road overpass was rebuilt a year or two before the old Hwy 10 overpass came down. I don't buy that explanation, someone must of royally screwed up here somewhere. 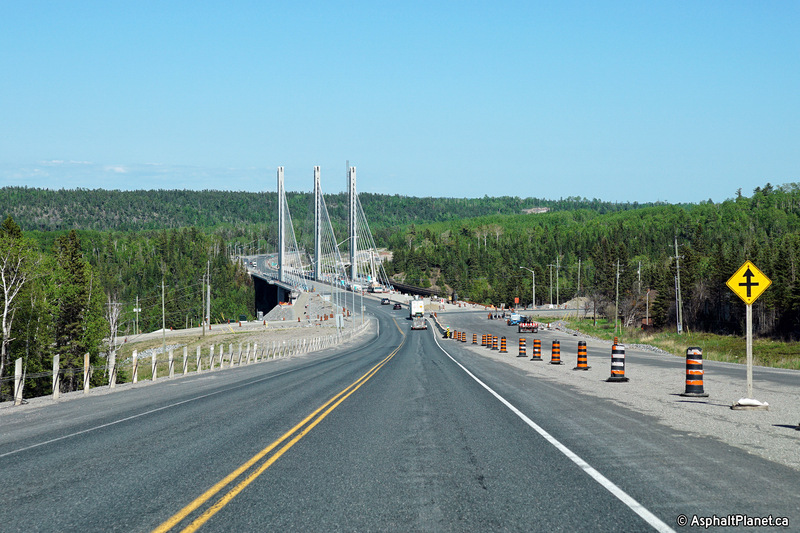 The McLaughlan Road overpass was completed in 2008. 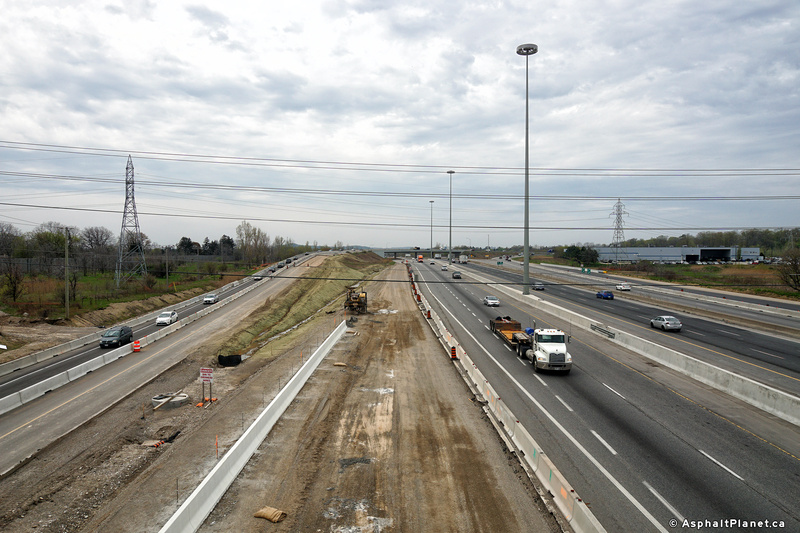 The Hurontario Street overpass wasn't demolished until 2011. There is so much oversight and hoops to jump through to get a shovel in the ground for any infrastructure project it's simply not possible that somebody just designed it for a phantom cross-section. 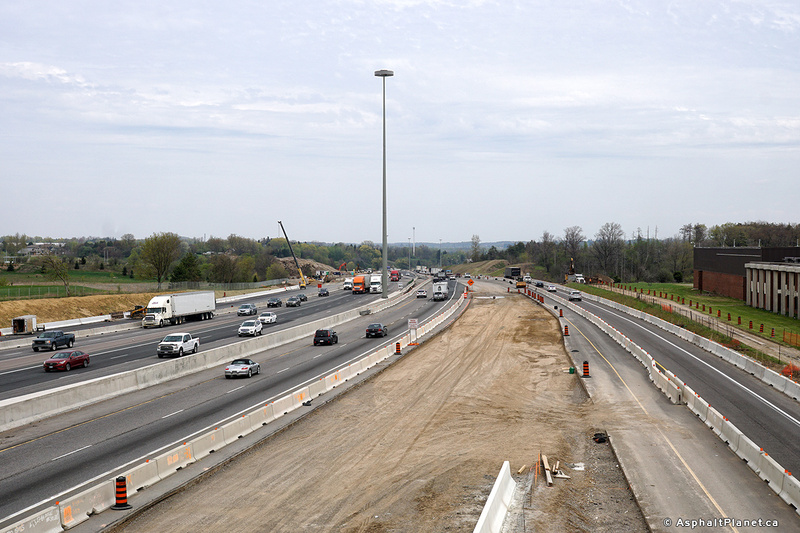 The McLaughlan Road overpass was constructed with a cost sharing agreement between the MTO and the City of Mississauga. 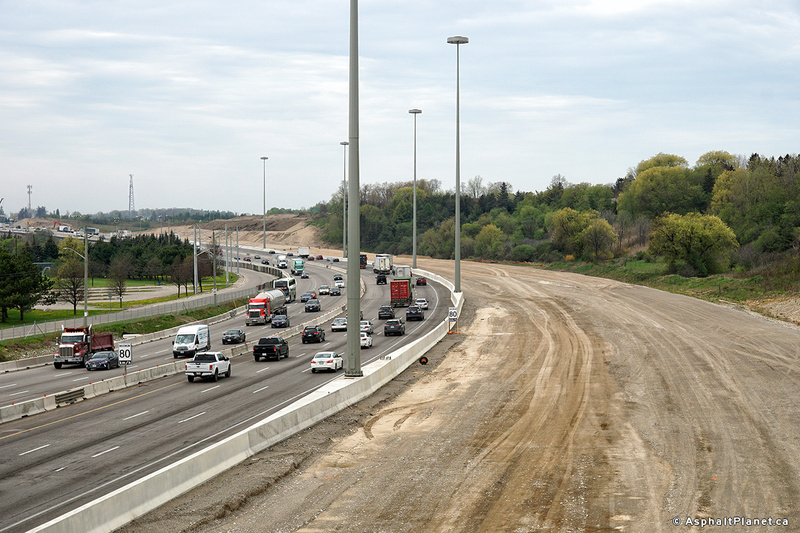 There was probably a lead time between the execution of the agreement between the MTO and the City of Mississauga and the actual start of construction. The likely explanation to me, at the time the the cost-sharing agreement was signed, the cross-section of the 401 hadn't been finalized, so the overpass was built based on a preliminary design for the 401. 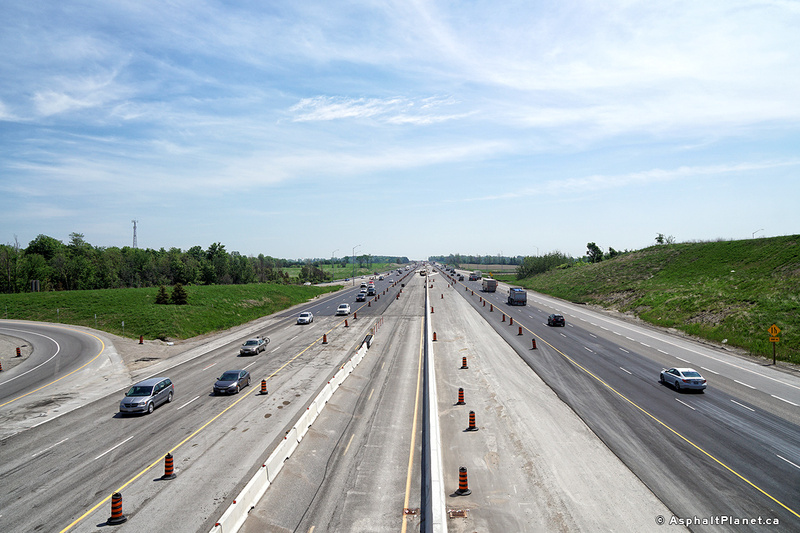 The cross-section of the 401 was probably changed and finalized during the time that the bridge was being constructed. MisterSG1, if you're so smart, please enlighten me with your alternative plausible explanation. 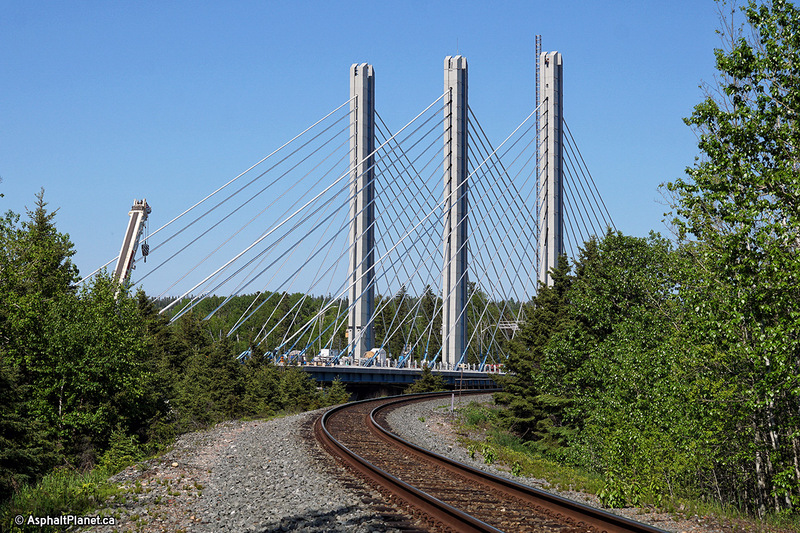 The point I'm trying to make, with these two bridges relatively close together, as in a few years apart. Unlike say the Kennedy Road overpass (early 90s I think), or the Mississauga Road overpass which I remember it being built in 2002-03. The old Hurontario bridge if I recall did not come down until a portion of the new Hurontario bridge was opened, nevertheless, if memory serves, the entire Hurontario project was completed in 2012. 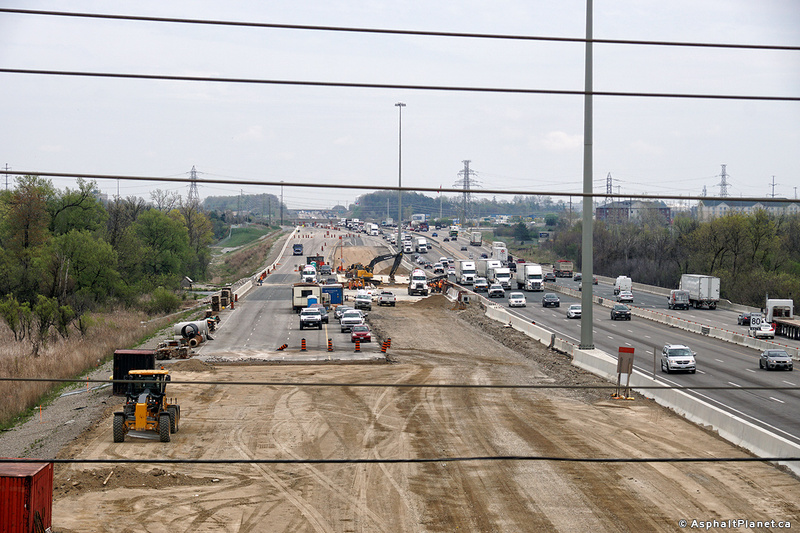 The Hurontario project begun shortly after the the McLaughlin project, not years later like when you compare the Mississauga Road overpass project to McLaughlin. Basically, I think it's somewhat sad that two closely planned projects, that it appears the left hand didn't know what the right hand was doing, and thus the collector lanes have to deviate slightly to avoid colliding with a bridge pier. Now do you understand what I'm trying to say? McLaughlin Road structure design was finalized April 4, 2008. The design for widening through there was finalized February 10, 2016. A lot can change in 8 years - revisions based on where transfers go, soil conditions, etc. * - this is why ones like the 401-Trafalgar and 400-Bayfield are still the original structures. Right now they're in a holding strategy with minor repairs here and there to get them through to the full redesign of their respective corridors, so they can avoid these little hiccups where they can.